Vegetation covers one of the kitchens. Wade’s Green is the finest and most-interesting plantation in the country. There can be a mosquito problem after heavy rainfall. We advise bringing insect repellent. 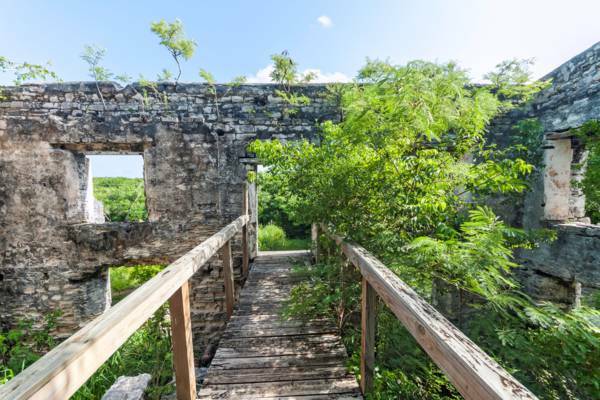 Wade’s Green is the best-preserved historical plantation ruin in the Turks and Caicos Islands and is a fascinating site to see when visiting North Caicos. We recommend that you visit this historical if you have the time. 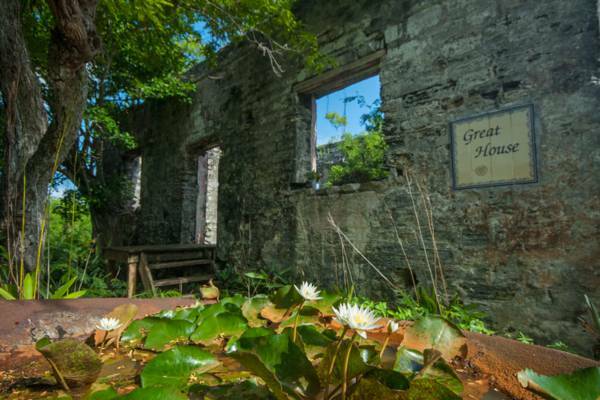 Wade’s Green Plantation historical site is managed by the Turks and Caicos National Trust and is typically opened on weekdays from 9:30-11:30 in the morning and from 2:30-4:00 in the afternoon. Admission and 30 minute tour is $10 per person. Tickets and a printed guide are available for purchase at the TCI National Trust office nearby in the village of Kew. No restrooms, shop, or office is onsite. For inquiries, information and Saturday entry, contact the North Caicos branch of the Turks and Caicos National Trust at +1 (649) 232 6284. Ruins of the Great House. Wade’s Green was established as a cotton plantation by loyalist Wade Stubbs in 1789. The land was granted to Wade Stubbs by the then reigning monarch of Britain, King George III, as compensation for losses incurred during the American War of Independence. The buildings at Wade's Green were constructed from hand-cut limestone blocks. During the plantation era, slavery was legal in British territories and many of the plantations in the British West Indies were worked by slave labor, and Wade’s Green was no exception. Records show that the first slaves in the Turks and Caicos were African slaves brought over from Bermuda in the later 1700s, and that the majority of subsequent slaves came with British Loyalists from America after the revolution. In 1834, the Slavery Abolition Act was made law by the British Parliament and slavery became illegal in most British territories, including the British West Indies. The descendants of these slaves make up the core of the native Turks and Caicos Islanders. Ruined quarters at Wade's Green. Wade Stubbs went on to become probably the most successful planter in Turks and Caicos history and at his death in 1822, he owned 384 slaves and over eight thousand acres over the Caicos Islands, including Wade’s Green on North Caicos, Haulover Plantation on Middle Caicos, and Cheshire Hall on Providenciales. Many buildings made up Wade’s Green Plantation, including the Great House, the kitchen, the overseer’s house, slave quarters and storage buildings. 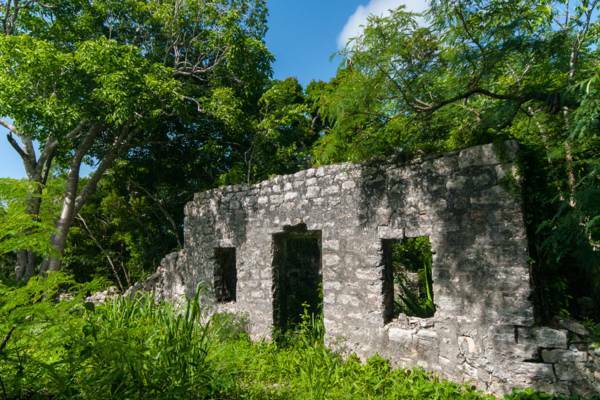 The plantation era in the Turks and Caicos started to come to an end in the 1820s due to soil degradation, plant diseases and insects, and changes in the world markets. 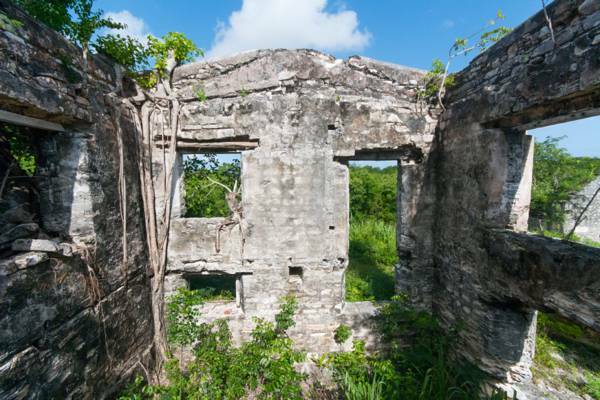 Agriculture had ceased to be the main supporting industry of the Caicos Islands. Wade’s Green Plantation is located near the settlement of Kew on North Caicos, and this general region was the centre of agriculture in the Turks and Caicos during the Loyalist days. Several other plantations were located nearby, including Teren Hill, Lewhy Moore Plantation, Mount Pleasant, Street Wall Plantation and Saint James Hill. As is evidenced by the present tropical dry forests, the Kew region also supports the best ground water stocks in the country, with the water lens in places being over twenty feet thick. These fresh water sources were essential to the plantations. Up until the last decade, Wade’s Green was mostly reclaimed by the surrounding vegetation and only the main buildings were accessible. As the number of tourists to North Caicos increased, the plantation grounds received some much needed attention. 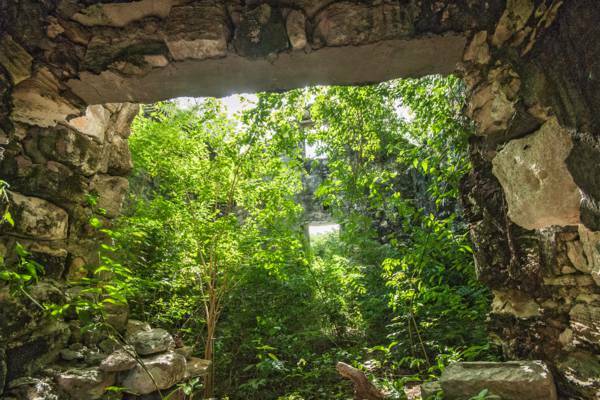 Currently, Wade’s Green is much more visitor-friendly, with unpaved paths leading through the ruins, and tiled plaques identifying many of the buildings. The interior of the Great House at Wade's Green. The grounds around Wade’s Green will also be of interest to natural historians. Examples of some of the plants traditionally grown in the Turks and Caicos can be seen along the paths, including cotton, sisal and papaya. Yellow Crowned Night Herons, Green Herons, small lizards and the unique and harmless Caicos Dwarf Boa are also commonly spotted around Wade’s Green Plantation. The dirt paths around the ruins are generally smooth and in good condition, but a minimum level of fitness is required as the car parking area is a quarter of a mile from the ruins. The Great House at Wade’s Green has some modern wood access steps and walkway. These fixtures are in disrepair and caution should be taken around them. Mosquitoes can be bad at times, so consider bug repellent and long sleeves. 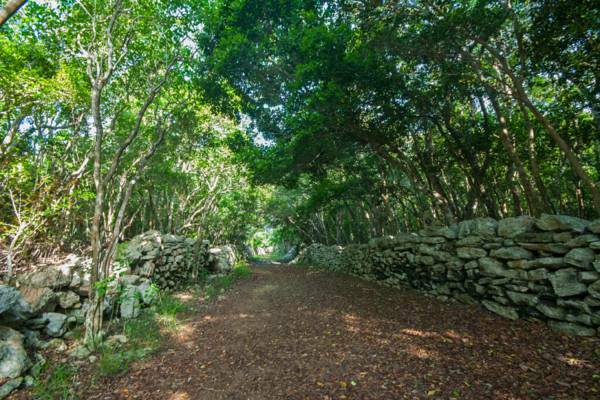 The trail leading to Wade's Green Plantation, North Caicos.